Hand Counters Are Used For Tallying Attendance At Various Events, Keeping Track Of Pitch Counts And A Variety Of Other Applications That Require Quick And Reliable Counting. 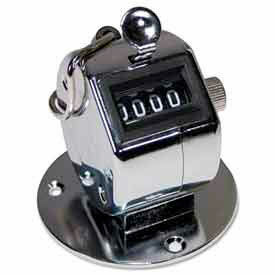 Hand Counters are made of chrome-plated aluminum for long lasting durability and dependability. Features a ergonomic grip for greater comfort and control. Advance count with ring finger and thumb for ease of use. Registers up to 9999 and resets to zero. Resets are Manual or Semiautomatic. Package quantity is 1. Event Supplies Provide An Economical Solution To Visitor And Crowd Control Wherever Visual Labels Are Required For Fast And Effective Identification. 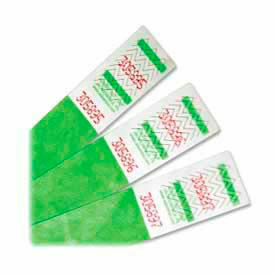 Event Supplies wristbands are made with durable single-use, waterproof DuPont Tyvek for parties, events, field trips or tagging inventory and supplies. Bands are sequentially numbered (choice of starting number not available). Features a peel-off adhesive closure. Available color finishes are Blue, Green, Purple, Red, and Yellow. Package quantity is 100.